A mesmerizing look at sports in the 1980s – when athletes became superstars, mavericks replaced heroes, and sports moved to the forefront of American culture. In the 1980s America sent to the White House an actor and ex-jock who fervently believed in the power of personal mythology, and Americans turned to sports to find their heroes. There was Bo Jackson, the man so strong he could break a baseball bat over his knee, the man whose athletic talents ran so deep that he starred in two sports while becoming a marketing pioneer. There was Jim McMahon, the Punky QB leading his Chicago Bears to Super Bowl glory while tending to his shades, his faux-hawk, and his can of beer. There was Brian Bosworth, terrorizing quarterbacks and averring that the NCAA stood for National Communists Against Athletes. And there was Len Bias, the best college basketball player in America and future of America’s best pro team, off to celebrate his selection as the number two pick in the NBA Draft and the power and money that would soon be his. 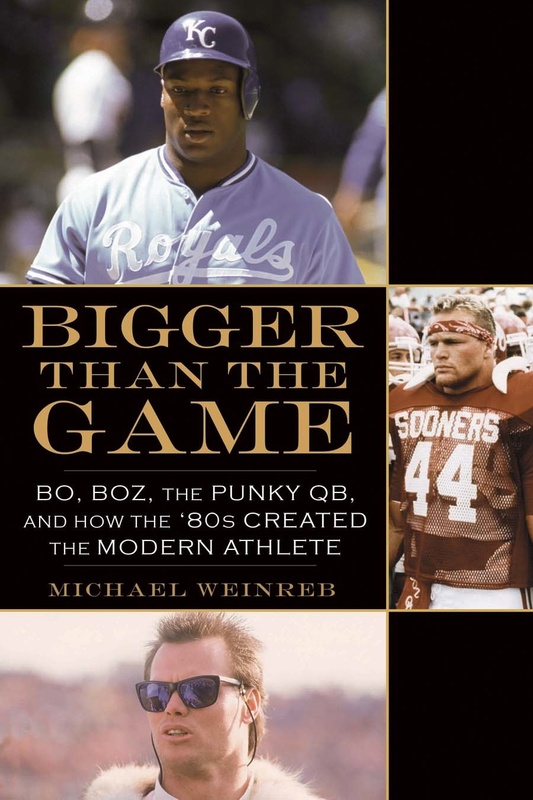 In Bigger Than the Game, award-winning author Michael Weinreb explores the era when athletes evolved from humble and honest to brash and branded. Weinreb explains how these players lived their lives in America’s living room, thanks to a new outfit called ESPN and the 24- hour news cycle that came of age in the (apostrophe?) 80s. They starred in music videos and in ad campaigns that promised they could do anything. They spurned their coaches, defied expectations, and were loved for it. In an era of “Just Say No,” they said yes to just about everything. An enthralling portrait of a fascinating period and its larger-than- life personalities, Bigger Than the Game recounts how excess, media, and the lust for fame changed American sports forever. “Weinreb brilliantly pinpoints the moment in the mid-1980s when sports changed forever.”–Dan Wetzel, Yahoo!